Searching for stripes: Scientists Simon Billinge, Milinda Abeykoon, Emil Bozin, and John Tranquada are making strides toward uncovering the role of "charge stripes" in superconductivity, the ability of some materials to carry electric current with no energy loss. (Phys.org) —Scientists at the DOE's Brookhaven National Laboratory have identified a series of clues that particular arrangements of electrical charges known as "stripes" may play a role in superconductivity-the ability of some materials to carry electric current with no energy loss. But uncovering the detailed relationship between these stripe patterns and the appearance or disappearance of superconductivity is extremely difficult, particularly because the stripes that may accompany superconductivity are very likely moving, or fluctuating. As a step toward solving this problem, the Brookhaven team used an indirect method to detect fluctuating stripes of charge density in a material closely related to a superconductor. The research, described in a paper published online in Physical Review Letters August 30, 2013, identifies a key signature to look for in superconductors as scientists seek ways to better understand and engineer these materials for future energy-saving applications. "In previous experiments, we've seen evidence of fluctuating "magnetic spin" stripes-patterns of how adjacent atoms' spin directions are arranged-that are compatible with superconductivity," said Brookhaven physicist John Tranquada, a senior collaborator on the research team. "Now we're trying to look at the arrangements of charge density, to see if there are alternating stripes of densely and more loosely packed charges. The charge part is harder to see." To get an idea of the difficulty of tracking moving stripes, think of the cars in a supermarket parking lot. The lines delineating the parking spots are like the positions of atoms making up a crystal, and the cars are like the electrons. If there's a pattern to the arrangement-say alternating colors of cars in adjacent spots-it would be easy to spot in a single snapshot. But if you took a single photo (with a very long exposure) over the course of a busy shopping day as cars moved into and out of spots, all you'd see is a blur. You wouldn't be able to tell if they continued to park in alternating order, if the details of the parking pattern were changing, or even whether there was a pattern at all. A series of individual snapshots might make the details more discernable. But in the case of analyzing materials science samples, the "snapshots" are often made with very intense x-rays or neutron beams. And access to beam time at these imaging facilities is limited, and expensive. "You can't throw enough 'light' on the problem to see it," Tranquada said. 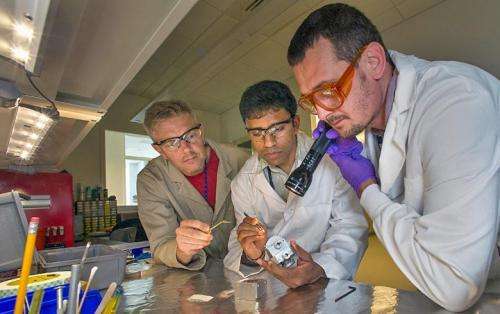 Attention to detail: Simon Billinge, Milinda Abeykoon, and Emil Bozin prepare to mount a sample for powder diffraction analysis. Instead, the scientists tried a completely different approach. Rather than looking directly at the stripes they looked for a telltale signal that indicates the presence of the stripes by association, but in a different measurement that can be done quickly and with much less precious beam time. They started these experiments on a material they knew had a static striped pattern below a certain temperature to make sure that the signal was evident in this new measurement. They then studied what happened as the temperature rose to see whether the stripes would either disappear or persist but start to move. The scientists ground up crystals of the test material into a fine powder and placed samples of it in line with a beam of neutrons at the Los Alamos Neutron Scattering Center at Los Alamos National Laboratory. Similar to the way light reflecting off an object enters your eyes to create an image, the neutron beams diffracted by the crystals' atoms yield information about the positions of the atoms. The scientists used that information to infer the material's electronic structure, and repeated the experiment at gradually warmer temperatures. "We're looking at the average crystal structure, the height-to-width aspect ratio of that structure, and how different the positions of the atoms are from that average," said Milinda Abeykoon, lead author on the paper. In the static striped arrangement, the atoms are displaced from the average in a regular way-like parking spots that are alternatingly wider or narrower than average. Such atomic displacements force the electrons to follow a stripe-ordered arrangement-the way smaller cars would fill the narrow parking spots alternating with wider SUVs. With increasing temperature, the scientists found that while the aspect ratio of the crystal structure changed, the displacements from average structure persisted, leading them to conclude by inference that the striped pattern of charge density also remained, even though it was no longer static. "This is the first powder diffraction scattering evidence for fluctuating charge stripes above the temperature where we see static order," said co-author Simon Billinge, referring to the new measurement. Billinge, who holds a joint appointment with Brookhaven Lab and Columbia University's School of Engineering and Applied Science, leads the collaboration that performed this study. "One of the most critical aspects of this experiment is that we had lots of different data points, lots of temperatures-so you can catch small deviations," said co-author Emil Bozin of Brookhaven. He also noted how improvements in detector technology made it possible to collect a lot of data within a fixed amount of time. "Ten years ago we would have needed a couple of weeks of beam time to do this experiment; we collected all our data in just a few days." The next step: Return to searching for stripes in superconductors. "This model system teaches us what diffraction-scattering signature to look for in copper-based superconductors to see if these fluctuations exist," Bozin said. That search should lead to better understanding of the role of stripes in superconductivity, and possibly to new approaches to engineer advanced superconductors for energy applications. 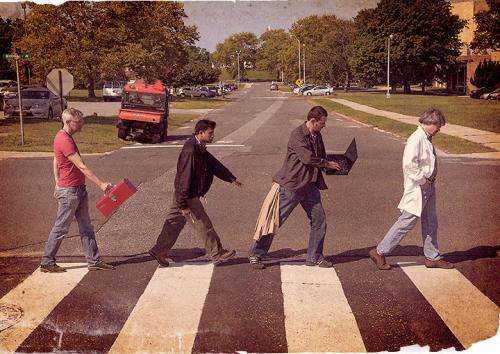 When I first saw the picture Beatles abbey road medly song came in my mind.